I frequently get calls and emails from folks who want to install our epoxy over an existing epoxy floor or coating that they have. They want to know if it is okay to go over it and what they have to do to properly prepare the surface. If the existing epoxy is a good hard solid one that is well bonded to a well prepared substrate it is possible. On the other hand if you are replacing it, what is wrong with the existing epoxy? Has the existing epoxy been badly abused by heavy sharp objects being dragged on it? Was the exiting epoxy damaged by chemicals beyond the chemical resistance of the existing epoxy? Are you just trying to upgrade the look of the existing epoxy? 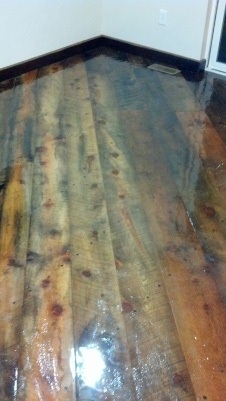 You should be concerned about going over epoxy that is coming loose from the substrate. That may mean that there was poor surface preparation. It may also mean that the quality of the epoxy might not be what it should be. You need to be concerned about epoxy that is wearing out. If it is wearing out you want to know why. My company and I personally started out as installers of epoxy. I have never seen or been made aware of any of Epoxy.com coatings and/or flooring systems that have worn out have come loose from the concrete. I have seen concrete so pounded by traffic that it came loose, but our epoxy was still attached and still doing its job. That is based on over 30 years of field experience with the products. Back to the question, “can I put epoxy over epoxy?” I always assume that the reason that the epoxy is wearing out or coming loose is that the epoxy is low quality or the installation was poorly done or both until I can prove otherwise. The way that I do that is to attempt to grind or shot blast off the existing epoxy. If after a substantial effort the epoxy cannot be removed and I cannot hear a hollow sound under the existing epoxy, I feel I have proven that the existing material is solid and well bonded. Let’s take a moment to discuss that dreaded hollow sound above. If the flooring system or coating is very poorly bonded you will get a sound from your grinder like you are dragging a piece of paper or a piece of stone under the grinder, or rubbing stone. When you tap it with a hammer you get a hollow higher pitch noise than you get when you tap solid concrete or a solid floor over concrete. You must be sure that the substrate is free of all types of contamination, including but not limited to oil, grease, food fats, curing compounds, sealers, laitance, dirt, wax etc. The existing epoxy left behind must be well bonded, and sanded until it has no shine. See Epoxy Surface Preparation Procedures for more information on this subject. “Where to Start” page may be the best way to get you off to a quick start. 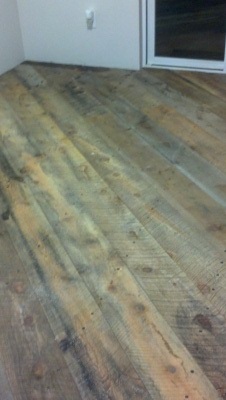 table top due to cupping in some of the boards. rather than separating back into the individual boards. were applied so it is much rougher. The owner was definitely pleased with the results. See larger versions of the pictures on this page. Epoxy.com Product #225 Water Cleanable Tile Grout and Ahesive.